Home › Whooper swan › Yellow bittern - Ixobrychus sinensis. The yellow bittern (Ixobrychus sinensis) belongs to the family Ardeidae. The yellow bittern species is distributed in Indian Subcontinent, Central and East Asia, Southeast Asia, Philippines and Indonesia. Ixobrychus sinensis species was previously included in the genus Ardea. The yellow bittern species are considered closely related to I. exilis, I. minutus and I. dubius. The yellow bittern species is a small bird, measuring 30 to 40 cm in length and weighing 80 to 100 grams. The wingspan is 45 to 55 cm. They have a short neck and long bill. The male is uniformly dull yellow above and buff below. Male has dull black to blue-grey crown and crest. It has brown forehead and sandy-brown throat. The neck and sides are streaked brown and buff. The breeding yellow bittern species habitat is reed beds. These bittern species inhabit fringe vegetation of water bodies. They are seen in freshwater marshes, ponds, lakes and pools with dense fringe vegetation. These bittern species feed mainly on insects and other invertebrates, fish and frogs. The breeding season of these bittern species is from May onwards. They construct platforms in the reed beds among shrubs. Four to six eggs are seen in the nest. These bittern species are distributed in Middle-East region, Indian Subcontinent, Russia, China, Japan, Southeast Asia, Philippines and Indonesia. These bittern species are mostly resident. The northern populations may move southwards during winter. The global population of yellow bittern species is estimated to be 100,000 to 1,000,000 individual birds. Considering the extremely large range of distribution, large population and insignificant decline, these bittern species are listed as least vulnerable. Habitat loss and increasing human pressure on the fragile habitats becomes a potential threat to conservation and management of these species. The IUCN (International Union for Conservation of Nature) has categorized and evaluated these bittern species and has listed them as of "Least Concern". 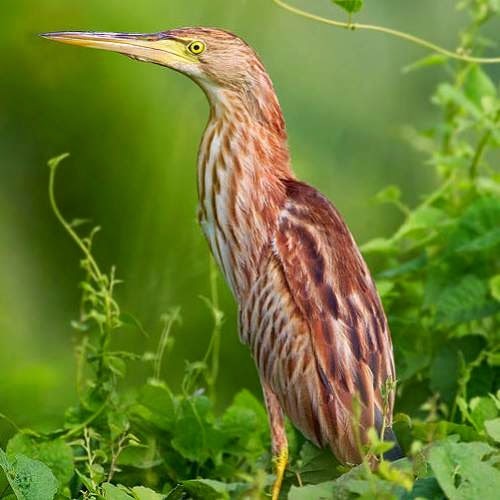 Current topic in Birds of India: Yellow bittern - Ixobrychus sinensis.